Has written on the back ‘Down goods leaving Stafford’, but obviously it isn‹t. The engine of course is a four—cylinder B class compound and the date probably about 1920. (because the engine seems in plain black—wartime paint). 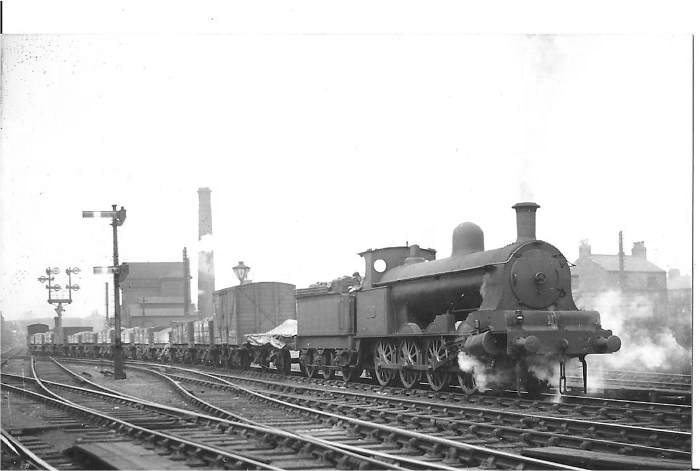 This looks very much like the eastern end of Chester station with the old gas works lurking behind the train! The Engine Head Lamp of one light above the right hand buffer denoted at this date c.1920 a "Through Goods or Mineral train, or Ballast train not stopping to work on the road." The system of Engine Lamps or "Head Signals" was altered during the Great War to, it is said, economise on the use of lamp oil. The former code for this type of train was three lamps across the buffer plank - above the right buffer, at centre, and above the left buffer. The appendix to the WTT c.1916 shows the former code crossed out and the new code added beside it. Of the three options I would say the train depicted was a "Through Goods" Class 8. Prior to the change a single lamp above the right hand buffer could be used for: "Light Engine or Light Engines coupled together, Engine and Break Van, or Bank Engine." The lamp was moved to the centre of the buffer plank for light engines etc in the revised system. As regards the latest addition to the Mysteries, I would like to add the following comments to what Gareth has to say re 171. Sorry it is a bit lengthy:: Gareth is quite right in saying that the lamp code for a �through goods� was changed during the First World War. When the LNWR adopted the Railway Clearing House codes on 1st February 1903 a �through goods� had three lamps across the bufferbeam. Previously, LNWR engines had had two lamp sockets only on the buffer beam, one at each end over the buffers. The centre lamp socket was provided for the RCH 1903 codes. From the 1st May 1918, however, the lamp code for a �through goods� was changed to �one on the right�. The full codes for all classes of train can be found in the Railway Clearing House records in the National Archives at Kew, specifically in the Minutes of the Superintendents� Committee, and I can confirm that the reason for the change is indeed clearly stated as �to economise on the use of lamp oil�. Sometimes I have been asked to give talks on the LNWR 0-8-0s to enthusiast societies, and when I have mentioned this point, people in the audience have sniggered disparagingly, clearly thinking this was an example of LNWR penny-pinching. In fact, it was no such thing, as I point out to them. It was a necessity caused by the dire shortage of supplies of all kinds caused by the war. This country by May 1918 was on its knees, to an extent only slightly less than Germany, and this change in the head lamp code was forced upon the RCH by the shortage of lamp oil. The Superintendents had in fact considered a change in head lamp codes in 1909, doing away with the three-lamp codes, but had eventually decided against doing so. Unfortunately, when I wrote my book LNWR Eight-coupled Goods Engines, I did not know about this change in the head lamp code and so was unable to include it � it had never occurred to me to look in the Railway Clearing House minutes. When I thought of doing so later and found the information, I put it in the article I wrote for the Journal as a follow up to the book: �D-viations, D-stractions and D-lights, A Diversity of Ds� Volume 5 No. 2. It can be found in the caption to the photo on page 10.